A striking, contemporary home on a hillside called for an equally modern and deliberately designed landscape. Bold rectangles of Corten Steel march down the slope, while grids of cut sandstone paths and rows of plantings mimic the linear architecture of the home. Attention to detail, drought tolerant and native plantings, and contrasting colors and textures make this garden a piece of art worthy of the the home. A fun, energetic, eclectic couple deserve a fun, energetic, eclectic place to call home. An eye for quality design and love of art flow from the inside of this home to the secluded back garden. 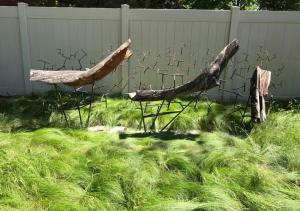 The unique garden includes numerous entertaining areas, spaces created to house quirky and personal art pieces, and multi layers of texture and color. The design includes several intersecting circles - the main patio, and herb garden, a checkerboard garden, and a lawn area - that represent intersecting cultures, families and friendships - the circles of life. The His and Her's garden - this dramatic, modern back garden features his and her's putting greens and a truly unique, sculptural steel vegetable garden. Crushed gravel paths unite concrete slabs to raised concrete, steel and Ipe wood planters to create a multi layered, sleek but comfortable design that easily moves from large entertaining to a quiet romantic evening at home. 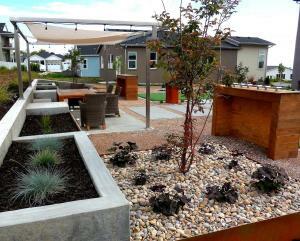 Plantings were selected for their structure and texture. Raised concrete walls define landscaped areas from the native, while providing retention down a steeply sloped lot. The walls help bring the architecture of the home out into the garden while providing functionality. A more formal front garden transitions into a more casual rear garden by maintaining continuity of geometric shape, but softening the materials through the use of local quarried stone stone utilized in the retaining walls and patio. 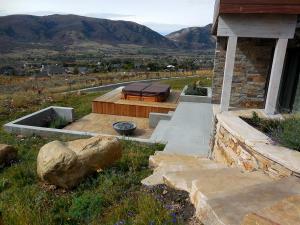 A raised deck minimizes the impact of the hot tub, and native grasses, penstemon and aspens framed in modern planters complete the contemporary look.